An Automatic Carpet Cleaner designed with Automatic Cleaning Technology to make carpet cleaning as easy as vacuuming. It removes deep down embedded dirt with FlexForce Power Brushes and its Auto Mix feature precisely mixes and dispenses the correct amount of solution for optimal cleaning while Auto Dry powerfully extracts water with HeatForce. Designed for improved cleaning performance and superior drying possesses enhanced features including HeatForce drying and Deep Clean mode. This heavy duty carpet shampooer for pets will tackle messes quickly and efficiently! It is a carpet shampooer and upholstery cleaner designed with what it takes to deliver premium cleaning results. Heatwave Technology and Dual DirtLifter PowerBrushes work to remove dirt and stains from your carpet and powerful suction lifts away. Plus, the hose and tools make it easy to clean stairs, upholstery, and hard-to-reach areas. The Pet Stain Tool sprays deep into carpet fibers to remove tough stains and odors. AUTO CLEAN – Motion sensing design eliminates the guesswork. AUTO MIX – Precisely mixes & dispenses solution for optimal cleaning. AUTO DRY – Powerful extraction with HeatForce for faster drying. FlexForce Power Brushes gently remove deep dirt, debris and pet messes. SpinScrub Brush Technology- Patented 360° counter-rotating, removable brushes gently wash and scrub sealed wood, vinyl, tile and grout from all angles. DualV Nozzle – Provides equal suction to clean surfaces quickly and evenly. Wash/Rinse Selector – Switches from Wash for carpets to Rinse to remove any solution residue. HeatForce -Applies hot air directly to the area you are cleaning for faster drying. Automatic Detergent Mixing System – Provides the correct mix of detergent and water for optimal cleaning results. Deep Clean Mode powerfully removes embedded dirt and stains for whole home cleaning. Quick Clean Mode with HeatForce speeds up drying to allow carpets to dry in less than 45 minutes. 25% larger tank capacity so you don’t have to refill and empty tanks as often. Dual DirtLifter PowerBrushes – Digs deep into carpet fibers, loosening and removing ground-in dirt. Heatwave Technology – Use hot tap water when filling your clean tank and the BISSELL Heatwave Technology will help maintain the water temperature while you clean. Dries in about an Hour – Whether you are preparing for guests or only have a brief moment before the kids get home, use Express Clean Mode a quick clean that dries in about an hour. Area Rug Cleaning – Express Clean Mode offers you the convenience to quickly clean your area rugs and have them dry in about an hour. 7 Ft. Hose and Spot Cleaning Tools – Attach the hose and tools for spot cleaning on stairs, upholstery, and pet beds. The 3 inch Tough Stain Tool is specialized for tough stains that need a deep scrub, the Pet Stain Tool is designed to spray deep down to the back of your carpet to remove stains and odors from pet messes. Hoover Smartwash – It cleans carpets, stairs, sofas, chairs & upholstered furniture! Hoover Power Scrub Elite – Carpets, sealed wood, vinyl, tile. Hoover SmartWash – Clean-up is always the hardest part, yet Hoover has made that as easy as possible as well. Simply dumped the dirty water in the toilet & rinsed out the receptacle. Cleaning out the roller brush is a bit of a hassle but it is still easier with this machine than any other. Keeping the machine clean is imperative because if the machine is not clean then your carpet won’t get very clean either. 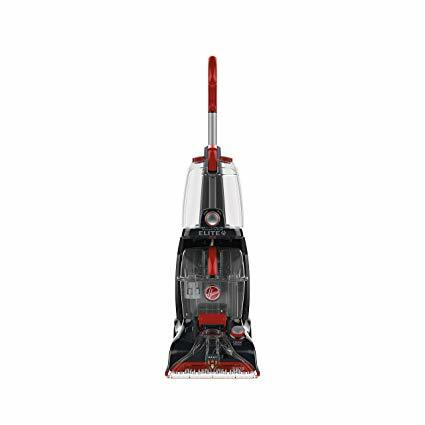 Hoover Power Scrub Elite – Cleaning takes a while because once you rinse out all the parts, you have to wait a day or two for them to air dry because some of the nooks and crannies aren’t exposed to the air very well. 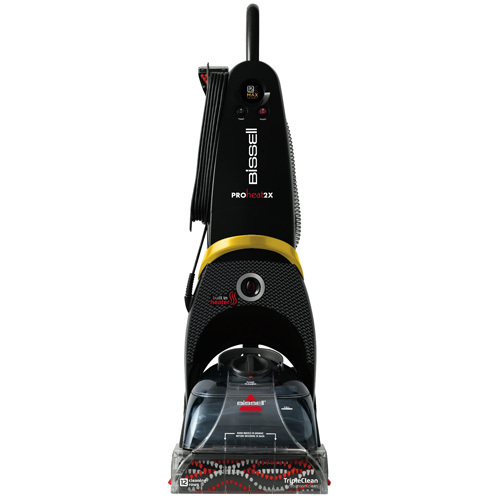 BISSELL ProHeat 2X – Cleaning tool and removable nozzle make it easy to clean. How is it when it comes to pet stains? Hoover SmartWash – Just five passes over the pet stains for them to come clean. Hoover Power Scrub Elite – Does a decent job of cleaning pet stains. BISSELL ProHeat 2X – If you have pet stains of any kind – this is well worth the investment. BISSELL ProHeat 2X – Rinsing is an optional step that can be done during the cleaning process or after the carpeted area has been completed. Switch to the water rinse setting, on the Custom Clean dial and follow the same path as you did for cleaning. Hoover SmartWash – So far there have been no complaints of leakages. 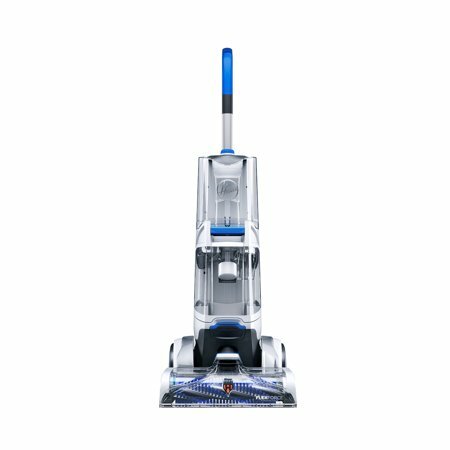 Hoover Power Scrub Elite – The biggest complaint with the machine is that it leaks out the back, just where the reservoir meets the main body unit. Tried cleaning the valve and opening area but to no avail. It’s not enough of a hassle to return the unit but it is an annoyance and just looks sloppy. The other downside is that if you do not vacuum thoroughly, the unit can and will use suction rapidly, especially if you allow dog hair to build up in the brushes or vacuum / suction channel of the cleaner. BISSELL ProHeat 2X – So far there have been no complaints of leakages. Valerie Barnes writes that it is a rugged design as compared to steam vacs. Carrie Dean says there are separate tanks for storing water and cleaning solution. Sarah Warner mentions that it is a near-perfect carpet cleaner that has got almost everything right. Caroline Nguyen says she likes the long brushes instead of small rotary round brushes. Diana Mann mentions- “The ease of popping the dirty water and clean water reservoirs in and out is so much easier. Kelly Strickland writes- “This carpet cleaner has a good amount of brush coverage”. Pauline Simon states- “The see through parts really make cleaning fun and observable. Because just about everything on the machine is clear plastic, you can see the dirt and water coming up out of your carpet”. Shawna Elliott says the removable brushes are fantastic which makes it easier to clean than the non-removable brushes. Joy Barrett says it works great and the carpets look and smells so much better. Rachael Baldwin mentions that overall, it is a really effective machine – if you take your time pre-cleaning the carpet (vacuum really thoroughly if you have pets or dogs, with a clean brush and bag, and spot treat) it does a remarkable job getting a lot of dirt and other filth out of a carpet. She also suggests rinsing thoroughly after using the soap cleaning to ensure the soap doesn’t impact the feel of the carpet fibers. Rosemarie Hart says- “Easy to assemble and the minimal instructions needed to get started are included”. Silvia Howard mentions- “It cleans well and has the ability to be used to rinse with regular water afterward, you can take it apart to clean it after use”. Margaret Guerrero writes that it uses only little shampoo. Samantha Elliott states- “It’s a little cumbersome to maneuver and I’m not confident the heat function had any impact on drying time but otherwise, I’m pleased”. Leona Stewart says that it does a good job of cleaning carpets littered with pet hair. Michelle Rios writes – “The carpet cleaner is fantastic! It cleans and leaves the carpet only damp. It extracts most of the water”. Geneva Chavez says it’s easy to put together, the instructions are straightforward and easy to follow. It’s easy to fill and empty while using. Connie Wilkerson complains- “On express clean I don’t feel it puts down enough water. On deep clean it dumps water. I feel that it needs a third setting in between the two”. Irene Ross writes that the upholstery tool is terrible. Hard to use, the trigger is hard to hold down, and it leaves everything very wet. Vickie Townsend complains that it has moderate loudness, it’s not quiet. Melody Hodges writes- “The cord is short so if you have a large room or connected rooms, be prepared to transfer the plug several times”. Another user, Rosemarie Brock, mentions- ” The new method sprays water and cleans whenever you push the cleaner forward and stops spraying when you pull it back. If you want to move forward without spraying (and soaking) your carpet, you have to push a button to put the cleaner in dry only mode. This is more work and less intuitive than the previous trigger design if you want to quickly scrub a stubborn spot or stain without over-saturating the carpet”. Pamela Aguilar says it doesn’t have a button to spray extra detergent if needed. Henrietta Mccoy adds that the hose is good, but it would be better if it was 2 feet longer. Jeanette Greer writes- ” It is big & it is not light, if you have a carpet to clean upstairs you can wait until you get the machine up the stairs before filling the water & cleaner solution reservoir so the machine is not quite as heavy”. Kari Jacobs, another reviewer writes- “The push and pull causes torque on your back. So just make sure you are prepared for that and I would recommend a warm up and stretch before working this beast for any length of time”. Hope Lewis says the power cord is too short. Joy Gordon writes that it stops sucking when it considers itself getting too full. Pam Yates adds it was not clear in exactly how much detergent to use as several tanks of water are depleted before the detergent tank. Lisa Mcgee mentions- “Handle had a seam that rubbed a blister on the palm of my hand during use causing me to have to wear a heavy glove on my hand to protect my palm when operating the machine”. Lindsey Potter says- “My only major complaint is how small the dirty water tank is”. Judy Olson writes- “The machine is a pain to empty the dirty water and rinse as most carpet cleaners are”. Bridget Young, another user says- “You have to fill the hot water tank very often”. Be the first to comment on "Hoover Smartwash vs Hoover Power Scrub Elite vs Bissell Proheat 2X"